I see them every jewish holiday that needs them imported as fruit from Israel. I'm not jewish so not sure of its name ! That tends to make me think that either the limited market or climate in OZ is not suitable. 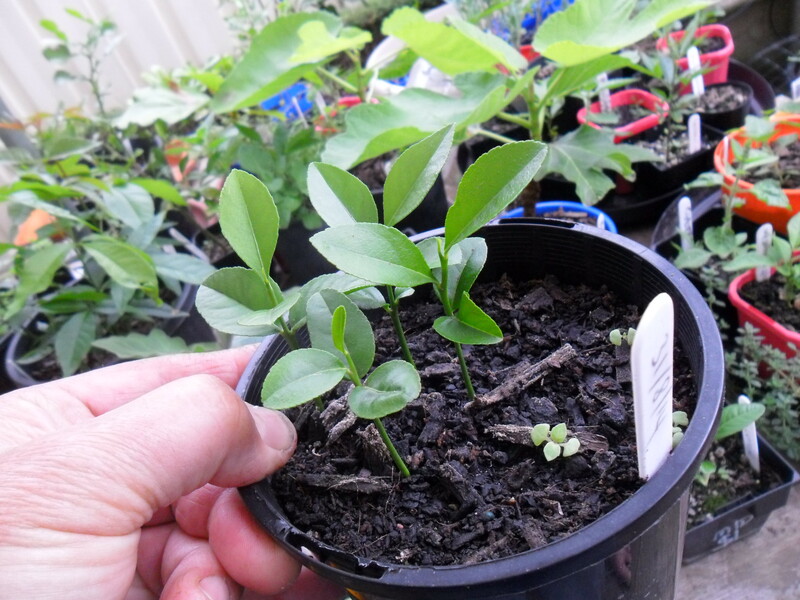 But saying that citrus will grow in colder climates if you protetc them from frost and pick a warm area of the garden to plant them in. Oh, yeah , try louis glowinski's book for tips of growing in melbourne. 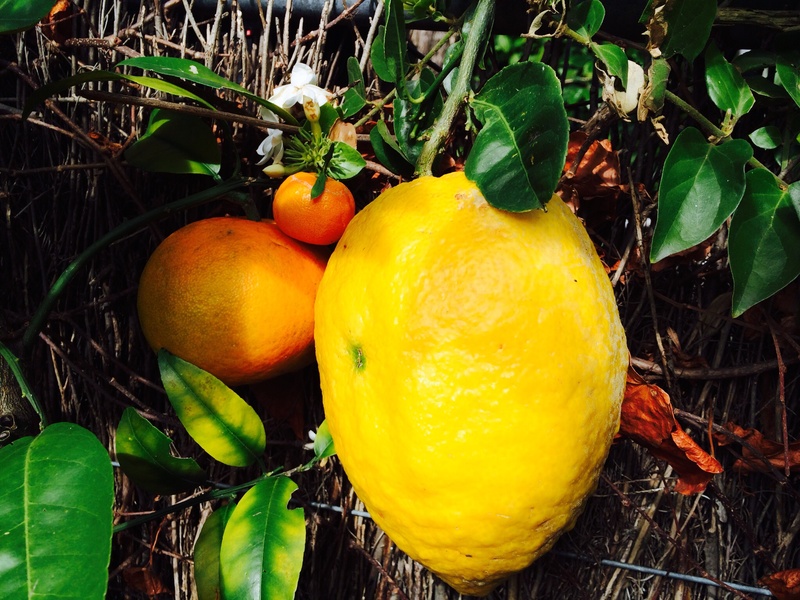 Here's my biggest Etrog next to my smooth Saville on which I placed a calamondin for scale. 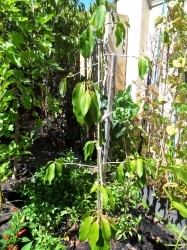 I have an established (5yrs) Buddha's hand and it survived around -5 degrees in a moderately sheltered spot. The outer leaves are a bit sad but it is otherwise fine, so I don't actually think it as sensitive as people say. My ertog was untouched, however that is in a pot next to the house, so it wouldn't have gotten hit so hard. Too much cold weather before they are ripe will make some fruit rot though. The citron is underrated as a vegetable (as opposed to flavouring), IMHO. 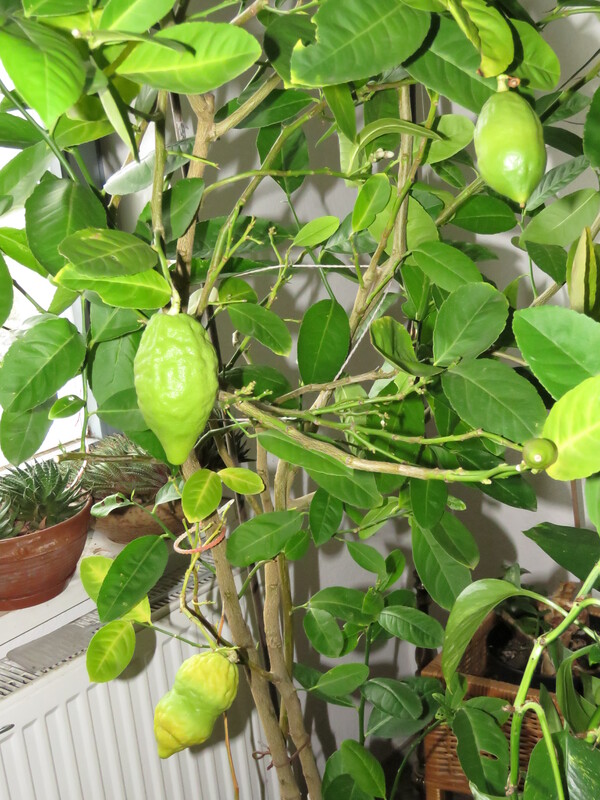 I munch on Buddha's hand 'fingers' and you can use the pith as a vegetable (much better if you remove the rind). I've used it in stir frys and sticky sauces for pork or chicken and there are a load of recipes for citron salad on the web which I will have a go at. Don't think orange or grapefruit pith. There is no bitterness and raw the texture is a bit like zuchini. 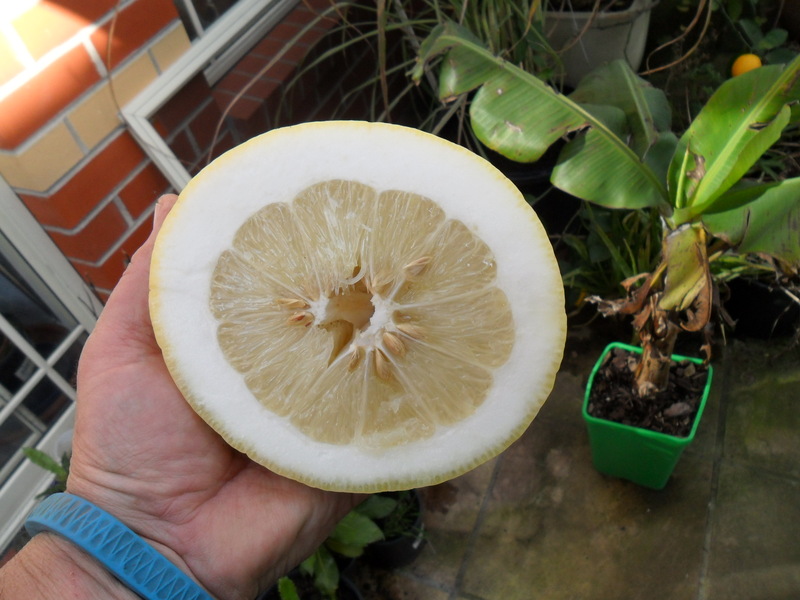 Here's an article with a recipe for Citron Salad complete with photographs. A good easy read. Saw your garden on TV yesturday ,it was brilliant. How do you do it? in such a small area. Cool - thanks Mary - the salad I made taste awesome - better than the giant Eureka pith i made a couple weeks ago. I couldn't resist either, Mark :). 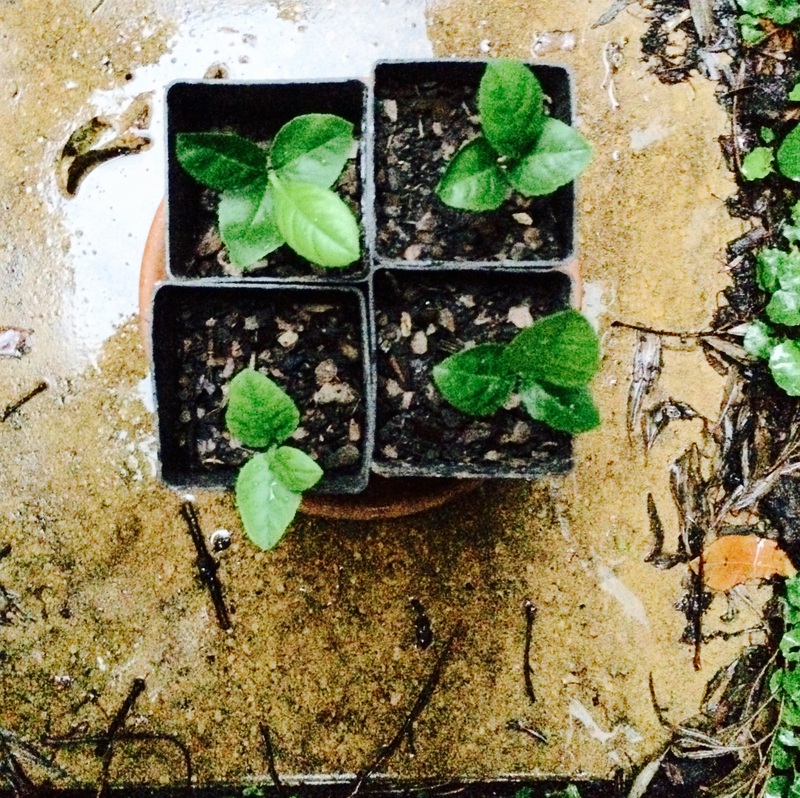 Here are some of my Etrog seedlings. Not a good pic; it's getting dark and still raining. I've been growing 4 esrog plants indoors for 2 1/2 years and finally a month ago 1 plant flowered and esrogs are growing! I live in bergen county NJ! I have a few Etrog Trees in pots. Winter inside and summer in the yard. The largest flowered (1 flower) 3 year ago, 2 ears ago several flowers, and last year a whole bunch. I got 3 Etrogim from it JUST IN TIME for Sukkot. Now it's winter (I'm in Germany) and I have lots of flowers. I didn't know what to look for last year, but it was Spring and the Bees knew what to do. Now…. no Bees. I don’t see what I can identify as a Pistil or Stigma on any of the flowers. I don’t know exactly if that’s bad, or whatever, but it makes it difficult to try and pollinate. 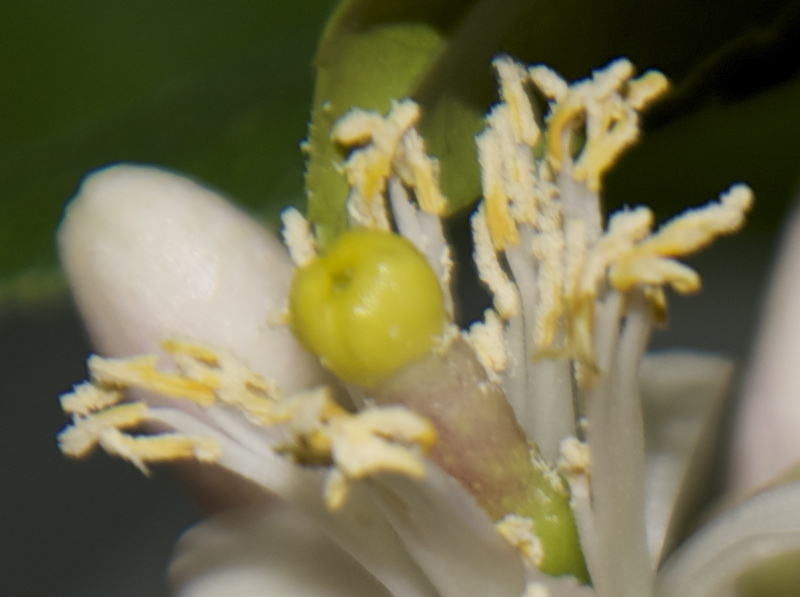 On your flower I definitely see what I think is a Stigma, although you seem to be calling it a fruit. Do you know any more now? Can you steer me toward further information?